Jean-Francis Auburtin (1886–1930) belonged to that generation of painters marked by both Impressionist painting and a Symbolist spirit. 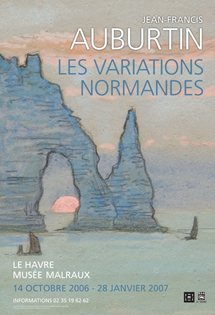 The symbolism of his art emerges strongly in the classical influence of the large decorative schemes he painted for the Sorbonne and the Conseil d'État. His taste for painting outdoors was made apparent when he followed in the footsteps of Monet. Like his great Impressionist elder, Auburtin painted Belle-Ile and Étretat before succumbing to the charm of Varengeville-sur-Mer. The little village south of Dieppe held strong appeal for artists, writers and musicians for nearly a century, from 1850 to 1950. Auburtin, like Georges Braque later, chose the village to build a house and studio. In 1907, he began painting the majestic cliff-lined seascapes on a daily basis. He tirelessly walked the coastal paths, but also set up his easel on the edge of the woods and often painted facing the sun. His backlit marine paintings show him to be a keen observer of changing weather conditions. His determination to understand the landscape and fluctuations of light can be seen in the development of series, a process he borrowed from Monet as much as from the great Japanese print masters. Like a French Hokusai, Auburtin excelled in the technique of gouache and watercolour. With great dexterity he captured on paper the most extraordinary and most picturesque viewpoints of the Normandy coastline. Although he was rather reserved by nature, the artist did not lead the life of a recluse in the village of Varengeville. He was close with the patrons of the Bois des Moutiers estate, which had a park overlooking the sea and gardens planted with rare rhododendrons and azaleas. A unique example of Arts and Crafts architecture in France, the residence built by Sir Edwyn Lutyens was designed as meeting place in harmony with art and nature. Jean-Francis Auburtin found in these bountiful surroundings renewed inspiration for his painting that subtly conveyed his intuitive understanding of the Normandy landscape. The exhibition presents nearly 80 artworks. Primarily executed in Varengeville and Étretat, most of the works are from private collections and on display to the public for the first time.